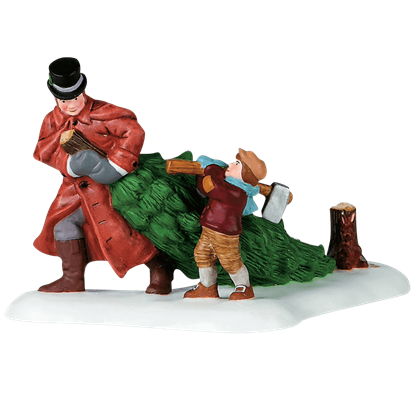 Bringing home the tree is the perfect way to start decorating for the holidays, as seen in the Christmas Beginning figure. The tradition of the Christmas tree found its way to England when Queen Victoria married Prince Albert. These convivial street musicians in the Jolly Good Tune figure look to be having a merry old time as they perform and would look great just outside one of the local pubs in London. They play for pennies or sometimes a pint! Properly dressed for the finest of affairs, this radiant couple sedately makes their way down the snow-covered streets to the event. 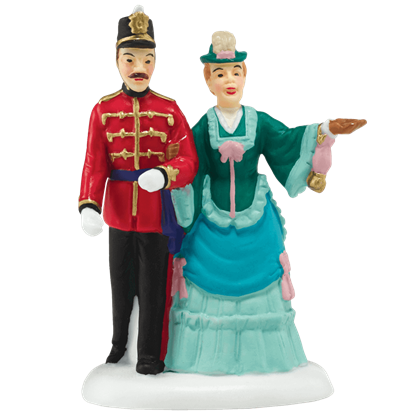 The Evening Stroll figure provides a fun piece to populate your seasonal village display. Using gaslight from the street corner lamp, this quartet sings a hardy Christmas ballad hoping to raise a few pennies for charity. 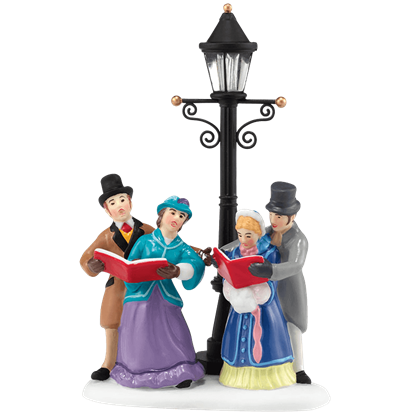 The Caroling By Lamplight figure shows one of the popular traditions of Victorian England. Many beautiful details enhance the Chelsea Market Tea Monger. Dressed in fine attire, the shopkeeper offers tea from floral urns. The street vendor helps visitors to the winter fair ward off the chill in the air with a hot drink! People have sung Christmas Carols for hundreds of years. 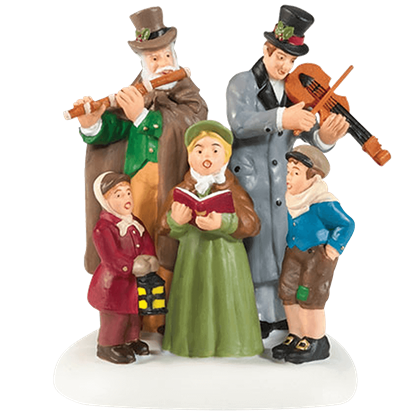 In the Victorian times, carolers standing on the street corner like these Dickens Carolers were a common sight as the singers and musicians entertained passersby. 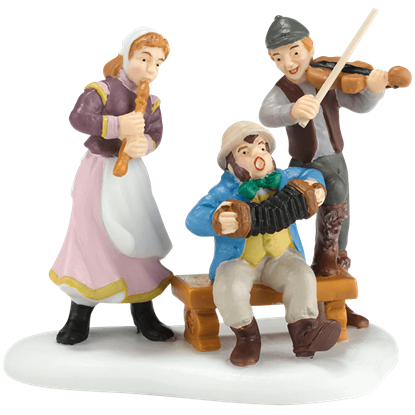 This Dickens Nativity scene looks great placed in front of a church or chapel in your seasonal village set. A traditional holiday decoration, this creche figure shows the baby Jesus in a manger between his parents, Mary and Joseph. 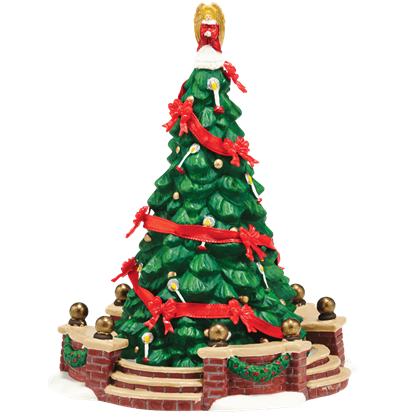 Let the majestic Dickens Town Tree decorate your next holiday village arrangement. 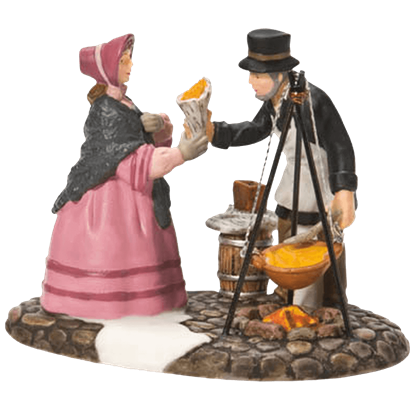 Part of the Dickens Village collection by Department 56, this hand crafted porcelain statue is adorned with red ribbon details for an authentic look. 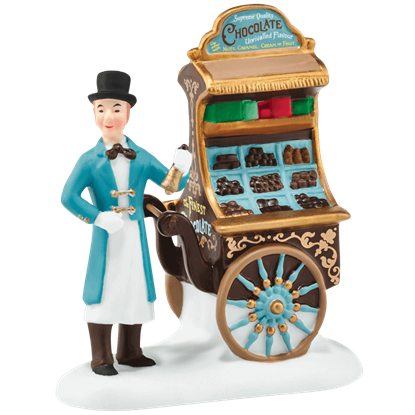 Dickens Village Sidewalk Sweets, by Department 56, makes a fanciful addition to any holiday village display. 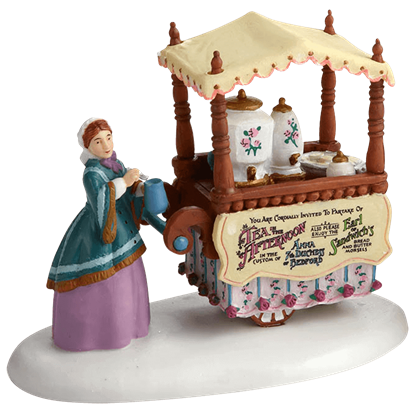 Hand painted in elegant light blue, brown, and golden colors, this statue is a part of the Dickens Village collection. In Oliver Twist, Charles Dickens references a fried fish warehouse, one of the earliest mentions of the dish that came to be known as fish and chips. The Fish N Chips To Go figure displays a traditional vendor serving a customer. 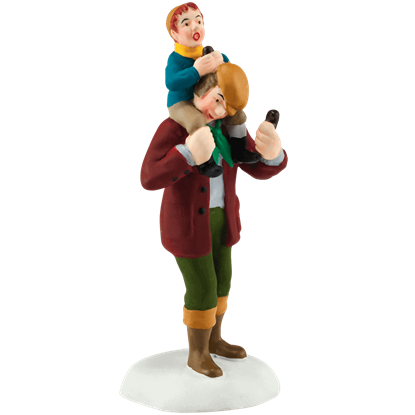 Part of the Dickens Village collection by Department 56, the Frost Fair Treat depicts a father and son duo enjoying their treats from the festival. 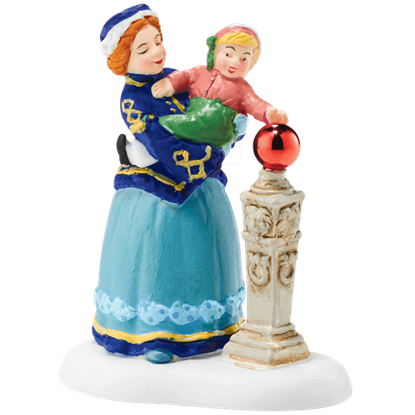 Made of porcelain, this delightful figure is hand painted and crafted in fine detail. A young mother in a lovely blue dress holds her daughter, who is captivated by her image in the round globe decorating the post. The Gazing Ball Reflections figure makes a charming option for populating your holiday town display.